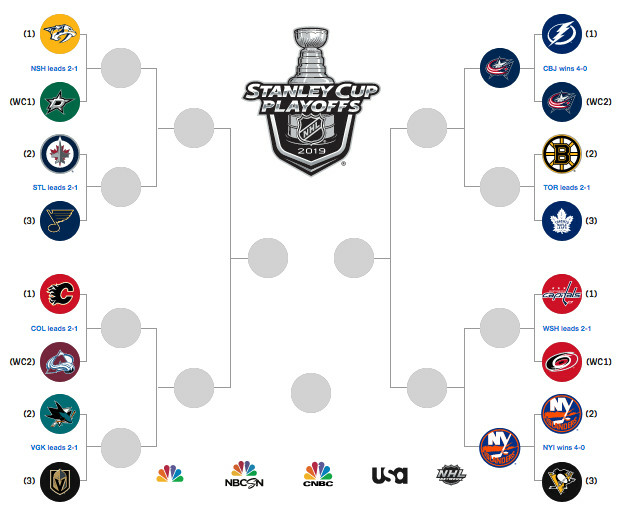 The 2019 NHL playoffs are here, and right away the team with the best record has been eliminated. The Tampa Bay Lightning won the Presidents Cup with 128 points, tying an NHL record with 62 wins. They owned the top seed in the Eastern Conference but were swept away by the Columbus Blue Jackets in four games. The defending champion Washington Capitals will begin their title defense as the Metropolitan Division champion, facing off against the wild card Carolina Hurricanes in an Eastern Conference first-round matchup. Alex Ovechkin, the NHL’s leading goal scorer with his eighth 50-goal campaign, was a man possessed in last year’s Stanley Cup playoffs, scoring 15 goals in 24 games. Last year’s playoff darlings, the expansion Vegas Golden Knights, this year are the third seed from the Pacific Division, after advancing to the Stanley Cup Final in 2018, their first season. Eight teams in each conference make the playoffs, and will battle in best-of-seven series to determine champs from both the East and West. The top three finishers from each divisions qualify for the playoffs, as well as the best two record in each conference outside of that group as wild cards. Higher-seeded teams get home ice advantage regardless of record. All series, including the Stanley Cup Final, are in 2-2-1-1-1 format. The Stanley Cup playoffs will be televised in the U.S. across NBC, NBCSN, CNBC, USA, and NHL Network, and CBS, SN and TVA Sports in Canada. Online streaming is available in the U.S. through NBC Sports Live Extra and fuboTV, and in Canada by CBC. James Holzhauer is breaking ‘Jeopardy!’ and making geniuses look like idiots Most winners average $19,980 a night. He’s taking home over $69,000. How are the Spurs doing this? No, really, how are the Spurs doing this? They just took a 2-1 series lead over Denver, with a former Division II guard in Derrick White leading the way. Even for them, this is remarkable. Ben Simmons’ broke the Nets’ spirit in Game 3. Nothing ‘average’ about that Ben Simmons was dominant in the Philadelphia 76ers’ road win over the Brooklyn Nets in Game 3 of their first round NBA playoff series. Hakeem Butler can be a unique weapon for the Chiefs Imagine what Patrick Mahomes can do with a 6’5 high-jumping wide receiver. This Article has a component height of 64. The sidebar size is long.